If you ask the average person on the street how to grow a plant in a container, they will undoubtedly tell you that you to put some dirt in a bucket or container and then the plant, water it regular and throw some fertilizer on it occasionally and away you go. Those who grow know it is not that simple (or accurate). Once someone decides to grow a plant or a crop and decides what they are going to grow, then they have to decide many other things like how hey will do it, where they will do it, and, most importantly, what they will grow in. Half of the plant will be in this medium/container for its life and changing is seldom an option. The choice has to be right first time. The first choice to make is the target plant to grow. This determines everything else the grower will do. It will determine what conditions have to exist in the root zone for the root zone to work correctly. Plants have evolved root systems to work with the environments they evolved in. Plants from arid regions have roots that do not do as well in water based systems like clay pebbles or gravel, they would do much better in an organic medium where the roots will see longer cycles between watering where as a tropical plant would prefer a shallower soil system with frequent watering in very well drained soils and so may do very well in these water based systems. It does not mean that they will not per- form, but the troubles that can be associated with these systems are not worth the effort, com- pared to being grown under ideal circumstances. The style the grower wants to use, field grown, hydroponic run-to-waste, hydroponic recirculation, or organic based medium (i.e. peat lite mixes, coco, mineral soil) has to be determined in the context of: first the plants capabilities and second the growers ability. These two things will determine the best container to use as well as the appropriate medium to grow in. Elaborate systems do not make better growers, they only make things difficult. Sometimes a grower has to use them to overcome obstacles (both physical and economic), but any design should be built with the KISS principle, Keep It Simple Stupid. A good grower will work with his or her attributes and limitations. If time is an issue, automate. If the grower is experienced and wants to ‘play’ then try advanced techniques. If the grower is new, leave it in a forgiving medium. Use what works but use it right. Roots are somewhat adaptive to a variety of conditions, from low to high values in many areas including pH, fertility, moisture, and aeration. They will grow and generally look good, but it is overall functionality that is affected by these conditions. Plants have exactly one function, to reproduce. The wrong pH values will change the ratio of nutrients that become available to the plant, yet as long as they stay within reasonable limits, it will flower well. Low fertility will affect the growth and vitality of a plant but it will flower. As long as some moisture is available to a plant it will flower. Air is critical to a root systems surviving not just working. 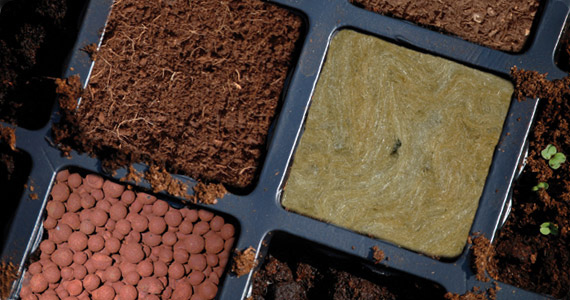 Make sure the medium fits the drainage and water retention characteristics the plant needs. These characteristics equate to one thing, porosity. Porosity is the value given for the amount of open spaces in the medium. This allows for three types of pores, large pores, small pores, and micro pores. Large pores are too big to hold water against gravity and are therefore considered air spaces, although some water will be found there clinging to the walls or immediately after watering. Small pores hold water against gravity under capillary action. These pores will also hold micro life such as fungi and bacteria, and the water in them remains accessible by the plant. Micro pores are very small pores that hold water which is not available to a plant and only the smallest of micro life will be found in them. When we speak of porosity of a medium it is in terms of percent (%) porosity. This percent is further broken down into percent large pores vs. percent small pores. A decent medium for container gardening will have a minimum of about 30 – 50% porosity of which about 17 - 25% is air space. This will vary based on the needs of the plant as some prefer less air and others much more. The advantage is that, after draining a newly watered container, the roots will see good air supply and still have a nice water buffer. So porosity also relates to drainage as well. The medium to use is based on all these considerations. Which container to use is based on plant size, medium used, and the growing environment. Remember that the root system mass should equal the top mass. A tree getting to 5 feet tall will have many problems in anything less than a 5 gallon (20 liter) container. If the crop can produce when smaller then use a smaller container and flower earlier but increase the number of overall containers. Sand will wash out of a container where soil or soilless mix will be better, sand will work well in a slab under NFT conditions where soil or soilless mix would compact and give mixed results. In short, pick the container size based on the crop and the medium. The system to use will be based on all this information. Remember this: it is always better to ‘pot up’ plants than to start big. 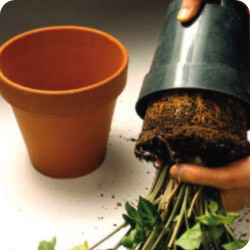 Potting up refers to taking a smaller container and moving it to a larger container. Un-rooted cuttings are ‘stuck’ into mediums or rooting trays, but rooted cuttings are potted up to beginning containers then potted up to their final home. This does several things including not overpowering a small plant with a large volume of medium. Excess medium does several things: it increases the amount of water that the plant will see, it takes longer to root into the container so this condition persists, the roots will use all the available nutrients around them but can’t be replaced because the medium remains wet, and it occupies more room which means more resources in space, light, energy and material. Start small; when a cutting is stuck leave it just until the new roots reach the outside of the new rooting plug, about an inch long. Then pot up this cutting to a smaller container based on the final container it will go in. For example, use a 2.5 inch square pot for planting to a 6 8 inch container, use a 4 inch container if the final home is 10 – 14 inch. You might need an intermediate potting up stage as well if the target plant is especially susceptible to these issues. Also use similar materials throughout, rock wool if the final medium is inert, coco or peat or sand if organic. This keeps the roots working on the same level and avoids big delays in production and survivability. Table 1 gives a very brief rundown of some of the types of medium currently available. There are many additional characteristics that can and should be taken into account when choosing. How much labor is required to use a medium, what effects will the plant produce, how much time can be spent monitoring the crop, and how is it disposed of after use, are but a few of the questions a grower must answer with the choice of medium. How to crop and grow a plant are just a couple of questions to answer in addition to the ones just mentioned when picking a container to use. Table 1 also lists the mediums in order of ease-of-use. A clay/sand soil will have the greatest buffers for nutrients and water; aeroponic systems will have the least. Rock wool takes more time to prepare and will have recurring pH issues. Inert mediums can have decent water retention with no nutrient buffering. Organic materials add back to drain water and should not be recirculated. Inert mediums require monitoring and precise measuring of nutrients and pH; this cost money in specialized equipment to monitor these components as well as increased labor costs. A beginning grower should start with an organic medium which will pro- vide the greatest margin for error and only progress to the next one once all the elements of good growth are understood and achieved such as light, water intervals, temperature control and humidity levels. In short, keep the system simple, grow in an easy medium and the right size container, and enjoy the garden. Some growers think that the best system to use is the one they will try next. Keep it simple; achieve your results first before moving on. Remember that it is not the system that makes the plants, it is the grower and the choices made by the grower that determine success. 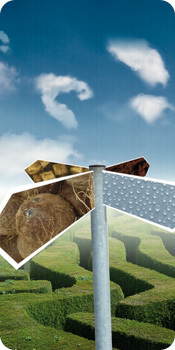 The right set of nutrients, composed correctly with correct ratios of fertilizer will produce similar results in any medium as long as all the other variables are in line; it is the mistakes that limit production.